I had made plans to leave Gros Ventre on Wed 8/21. But as any RV’er will attest to, plans are made in Jello. Jane had just returned from a hike with Dave and Celeste and mentioned they had run into Shannon on the trail. They invited me to go with them to Dornan’s to meet up with Shannon for dinner. I couldn’t turn them down so went with them. I had a good time at Dornan’s and the food was good as usual. Then when we were leaving I mentioned to Shannon that I was going to be leaving the next morning and probably wouldn’t see her until the Amazon stint. She mentioned that she wanted to invite me to go dancing with her and Tony and his wife Susan at the Million Dollar Cowboy Bar. Let me reassure you – I am not a dancer by any means. I can’t even remember the last time I went dancing. But I couldn’t turn Shannon down since I never did get over to see her campground where she is hosting. So I agreed and she told me to meet her at the Merry Piglets restaurant in town. The Merry Piglets is a Mexican Grille. It doesn’t sound like Mexican to me but it was good. Then off to the Million Dollar Cowboy Bar. My old ski partner years ago had told me about this place and said I had to go to it while I was in Jackson. I couldn’t turn both Shannon and Randy (my ski partner) down. Besides the Million Dollar Cowboy Bar is world famous. I found out once we got there that Thursday night is dance lessons night and if you get there before the crowds you don’t have to pay an admission fee. Sounds good to me. 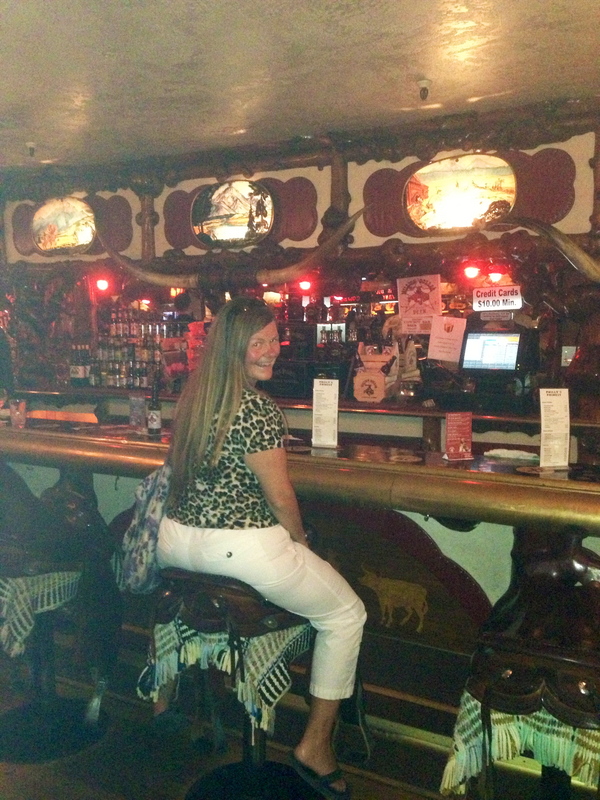 So after dinner we headed to the Million Dollar Cowboy Bar. The bar stools are actual saddles that you sit on. Very cool. I got the following pics of us sitting in the saddles. It was fun sitting at the bar, but then all four of us sat at a table near the dance floor. Then the instructions started. The first dance was the swing. The instructors were very good dancers and very patient with all of us, especially the ones with two left feet like me. We learned quite a few moves and surprised ourselves that we could actually dance although not the most fluent. Then took a break for some adult refreshment and came back to the dance floor to learn the two step. Slow slow fast fast fast. Holy cow what are they doing to me. After practicing our newly learned steps they introduced the band. They said that we could dance either the swing or the two step to any of the music they played. That’s what they think!!! HA! Once the band starts all of the people who really know how to dance well hit the dance floor. I felt like a real clod! It was all I could do to not stay out of their way. We didn’t do too badly though. It was a lot of fun. I would not have even gotten out on the dance floor for the lessons had it not been for the encouragement of Shannon and also the beers and wine I had before even attempting such a feat. I will not bore you with any pics of us dancing as I don’t have any. Thank God! It was a very fun time and I even mentioned to Shannon that we must find a cowboy bar in Fernly, NV while we are working for Amazon to perfect our steps that we learned. HA! I had a good time even though it is against my better judgement to ever go dancing. We said our goodbyes and down the road back to the campground. I was really glad I went and didn’t feel too badly in the morning despite my wine and multiple beers. I was all packed and ready to go so it was just a matter of hooking up the car. Thanks Shannon for a GREAT time! 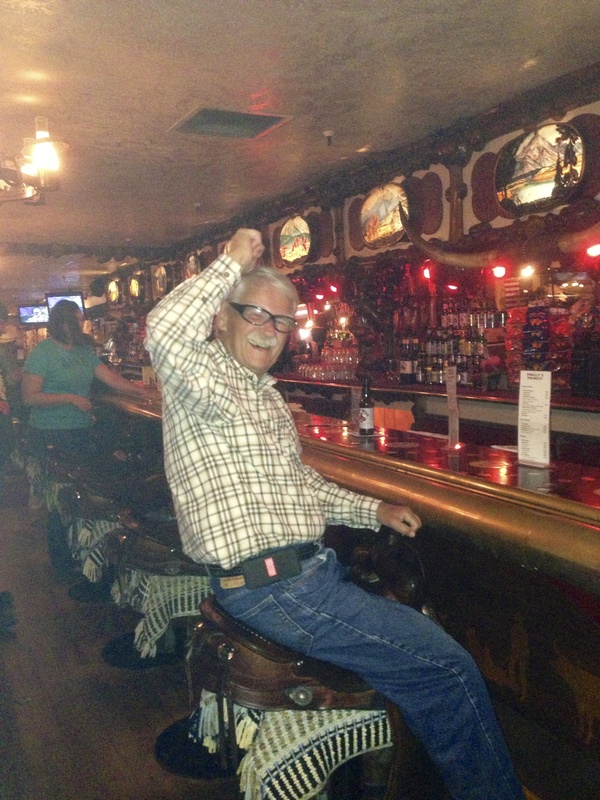 This entry was posted in Dancing, Gros Ventre Campground, Jackson Hole, Million Dollar Cowboy Bar, Wyoming and tagged Amazon workkamping, Dancing, Million Dollar Cowboy Bar, My Friends, Wyoming by Jim Melvin. Bookmark the permalink. Good for you , Jim ! If you ever have a chance to square dance, try it too, it’s a lot of fun. Looks like you had a fun evening! I took line dance classes when we were in Mission, TX last winter. Even though I never cared for country music it was fun. Couldn’t get Jim to join me, though. Maybe you can teach us the swing in Quartzsite! Good Lord, you did very well. No wonder with THAT girl. Life is good, Jim!! Way to go Cowboy. I met my Jim when he asked me to do the two step with him in a good ole country bar. And I still have two left feet but it’s so much fun. When do you start your job in Fernley? I don’t remember anything anymore. Wow we’ll have to find a cowboy bar in Albuquerque so you can show us all your new smooth moves. 🙂 so glad you are having fun and open to new experiences. We’re going to have to find a place to go dancing in Q this winter.